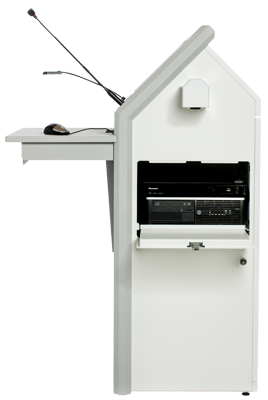 Tecom | TecPodium Interactive | Audio Visual Podium | How Does It Work? TecPodium Interactive - How Does It Work? TecPodium is easy to use. Simply click a single button to switch between sources and control the AV equipment! Save valuable time on design-build, programming and integration! Pre-configured and ready to work, simply Plug and Play!